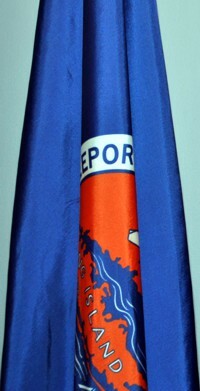 It is a dark yellow flag with a seal-like emblem centered on it; this is shown in white with blue lining and consists of a double-rimmed ring with the inscription "Town of Hempstead, N.Y." from "7 to 5 o'clock" in large serif capitals and "founded 1644" in small sans-serif capitals on the remaining space; on the central area of the shield, the national coat of arms of the United States (isn't this a misuse?) with a squarish scroll reading "Nassau County" as its crest. "Lofaro added, 'You know as I walked into the hall tonight I noticed all the flags in the front here and how they related to all that Trustee Barbieri and has done for us. 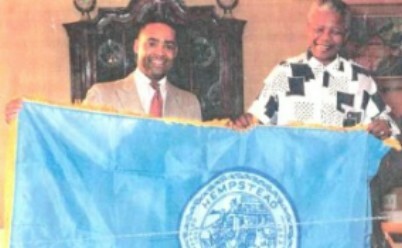 The green flag is from Town of North Hempstead and Donald got $250,000 from them; the orange flag is the County of Nassau and he got $100,000 and secured nearly a million dollars in block grants from them; the United States flag at the end represents the federal government and Donald received $2 million from them. The yellow flag is the flag of the Town of Hempstead and Donald, you have four more years to work on them." The Village of Hempstead is within the Town of Hempstead (see below). The Village of Floral Park in New York has a population of 15,967 and a land area of 1.37 sq. miles. It is part of the Town of Hempstead and the Town of North Hempstead in Nassau County. The flag is dark blue with a seal showing three flowers. Above is written the name of the village, and below are three stylized flowers and the date 1908. Another image of this flag can be seen here. This image is a cropped version of the photo which appears at www.floralparkhistorical.org/Floral-Park-NY-Historical-Society-Newsletter-May-2012.pdf, the May 2012 online issue of the "Docent's Digest", the newsletter of the Floral Park Historical Society. The photo is part of the lead item : "Floral Park Historical Society Given Historic Flags". According to the item the FPHS was given the original village flag, created 1955, and a Floral Park Civil Defense flag dating from the 1950's (displayed in the background of the above photo and shown more fully later in the newsletter). 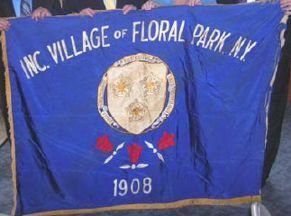 Further along in the newsletter is additional information, "FPHS Accepts Original Floral Park Village Flag", which states that the flag was officially adopted by unanimous vote of the mayor and village trustees on 1 February 1955. Also, the idea of adopting a flag was first proposed by Village Trustee Lopez in June 1953. The flag was designed by Ruth Backiel, a local teacher. "SIZE: The Flag is 52 inches by 66 inches"
"BACKGROUND: the entire background of the said flag is navy blue." "DESIGN: Across the top portion of the Flag appear the words 'Inc. 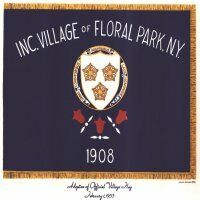 Village of Floral Park N.Y.' embroidered in white. In the center of the said flag appears the Village seal embroidered in gold upon a white background. Inscribed in the outer rim of the said Village seal are the words 'Urbis Conditoribus Posteribus Laus Honorque.' Directly below the seal there appears a cluster of three red roses and three leaves which representative [sic] of the name of the Village and the main street therein. At the bottom of the Flag is the number '1908' embroidered in white number, representing the year of incorporation. Gold fringe is attached around the outer edges of the flag for decorative purposes." The mayor at the time said that Floral Park was the first village to propose an official flag, but that 2 others had acted quicker and adopted flags before Floral Park did so (I suspect he meant only villages in Nassau County). The motto is translated as "To the Founders of a City for Prosperity be Praise and Honor." I would have thought that the translation should have read "To the Founders of a City for POSTERITY..."
An (incomplete) image of the flag of the village of Freeport, New York, USA appears on the Mayor's website. The link is at www.freeportny.com/images/pages/N360/DSC_4104.JPG. It is a blue flag with the seal centered. I found the above image of the flag of the Village of Hempstead while browsing the web. It is a light blue field with the village seal in the middle. How it came to be in Nelson Mandela's hands I cannot say for sure- I cannot find any accompanying text to go with it. But it was part of a website of an HIV activist who separately mentions visiting Hempstead and meeting the mayor and visiting with Mandela, so there is probably some sort of logical explanation. The flag has a field of light blue and bears a light blue & white rendition of the village seal in the center. A differently colored version of the seal can be seen at www.villageofhempstead.org/. Designed by Patrick James Algier, Confirmed by the Point Lookout Civic Association, and Adopted by the Community Abroad as the Official Flag of the Town of Point Lookout, NY. Finally, underneath the telescope are the initials "P L". Of course representing the name of the town, Point Lookout. The PL Flag proudly flies in Point Lookout, NY on civic flag poles, over homes, businesses and boats - in addition to being displayed nationally/internationally by the many admirers/visitors of this popular seaside community.